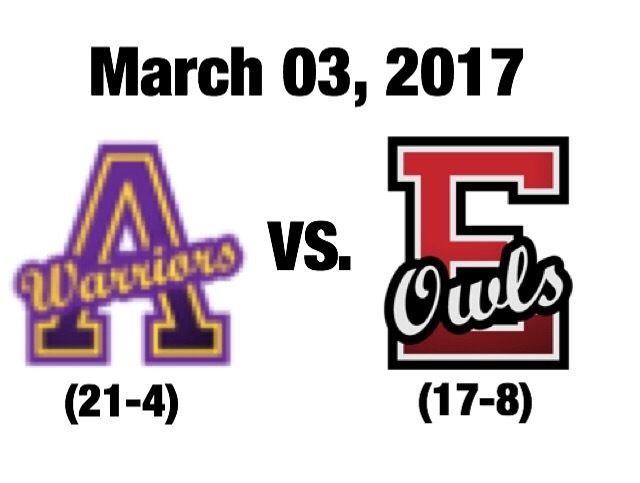 The Anadarko Warriors will be taking on the Elgin Owls on March 3 at 8:00 PM. This game will be play at Swosu in Weatherford. This matchup has been one of the most exciting all year, in the first meeting Anadarko won 50-43 and in the second Elgin would win 45-30. Coming into this game Anadarko’s record is 21-4 which puts them at #9 in 4A. Coming into this game Elgin’s record is 17-8 including winning 11 of their last 12. The winner of this game, will advance to state and the loser will have to play Saturday at 6:30 to to go to state. Elgin caught fire just at the right time, winning 11 of the last 12 games, through this stretch they have averaged 60 points per game. Some players to watch for Elgin are Tanner Meraz who is a good all around player and Greydon Buhlig. While Elgin is playing well so are the Warriors, winning 13 of their last 14. The Warriors only loss during this stretch was to Elgin. Anadarko is a very balanced team, where Adrian Labrador can shoot the three, James Davis and Christian Braveheart attack the interior. 3. Establish Tanner Meraz early. 1. Have to defend Tanner Meraz, he can score fast and is very athletic. 2. Establish the 3 pointer early, put up a lot of points quick. 3. Free throws will be a big key to this game for both teams.